Sometimes I see a blog post and my jaw just drops. And then I start drooling. This is a little embarrassing when I’m checking on blogs at work, but whatevs. Today is such a day. I saw a Facebook post from fellow blogger, Let Them Eat Healthy, that combines creamy white beans, grilled asparagus, a fried egg and bacon crumbles. Oh. My. Goodness. I love roasted asparagus topped with a poached or sunny side up egg, but this looks like a little party for your mouth. And what a great Mother’s Day brunch idea! I reworked one meal this week to include a variation of this amazing, awesome recipe. 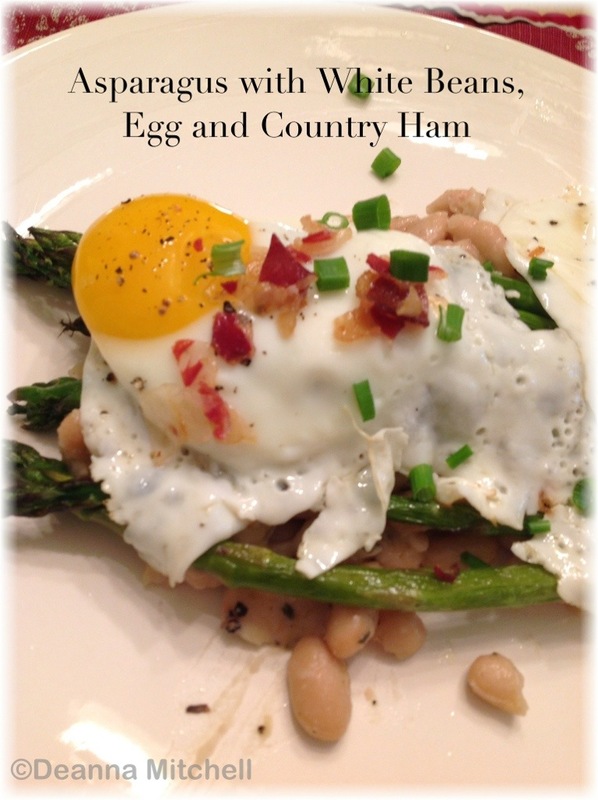 Every ingredient in this dish is a favorite of mine and all except the white beans are available from local farmers! We roasted the asparagus instead of grilling and used some local, thinly sliced, smoked country ham instead of bacon–DELISH!!! The photo above is our version! HERE is the link to the blog post and recipe. Definitely check it out. This is way better than anything I had ready to post today! One of the wonderful things about connecting to the larger blogging world is all of the wonderful people and new ideas! Thanks for the link, Deanna!